The Revolution Starts at Home is as urgently needed today as when it was first published. 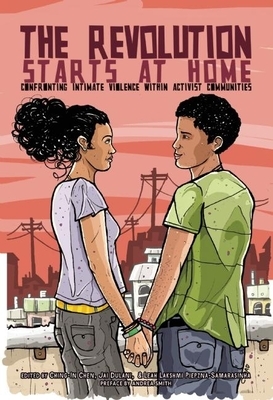 This watershed collection breaks the dangerous silence surrounding the "secret" of intimate violence within social justice circles. Just as importantly, it provides practical strategies for dealing with abuse and creating safety without relying on the coercive power of the state. It offers life-saving alternatives for survivors, while building a movement where no one is left behind. "This book has brought me back from the brink of desperation many times. Its creative, real-world stories of interrupting intimate partner violence without using police or social services strengthens our community, builds our collective imagination, celebrates our resiliency, and pushes us to hone our practice. I keep a stockpile of this book on my shelf for gifting--it's required reading for justice seekers. --Shira Hassan, founder and principle consultant for Just Practice. Ching-In Chen is the author of The Heart's Traffic, and a genderqueer and multi-genre writer. Born of Chinese immigrants, they are a Kundiman, Lambda and Callaloo Fellow and a member of the Macondo and Voices of Our Nations Arts Foundations writing communities. A community organizer, they have worked in the Asian American communities of San Francisco, Oakland, Riverside and Boston, as well as helped organize the third national Asian Pacific American Spoken Word and Poetry Summit in Boston. Chen is also the co-editor of Here Is a Pen: an Anthology of West Coast Kundiman Poets. Jai Dulani, Senior Development Manager at Race Forward, is a writer, filmmaker and social justice activist. From 2011- 2015, Dulani served as Co-Director of FIERCE, supporting the leadership and power of LGBTQ Youth of Color who are organizing at the intersections of gentrification and police violence. Dulani has been a Kundiman Asian American Poet Fellow, a VONA/ Voices Fellow, and a BCAT/ Rotunda Gallery Multi-Media Artist-in-Residence. Leah Lakshmi Piepzna-Samarasinha is a queer disabled femme writer, performance artist and educator of Burgher/Tamil Sri Lankan and Irish/Roma ascent. The author of the Lambda Award-winning Love Cake, as well as Dirty River, Bodymap, and Consensual Genocide, her writings on femme of color and Sri Lankan identities, survivorhood, and healing, disability and transformative justice have appeared in the anthologies Octavia's Brood, Dear Sister Letters Lived, Undoing Border Imperialism, Stay Solid, Persistence: Still Butch and Femme, Yes Means Yes, Visible: A Femmethology, Homelands, Colonize This, We Don't Need Another Wave, Bitchfest, Without a Net, Dangerous Families, Brazen Femme, and A Girl's Guide to Taking Over The World.